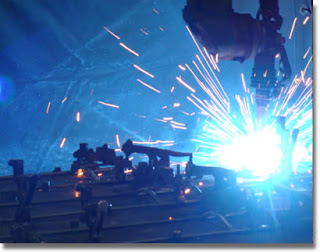 Vertical-up or -down in robotic welding? We have a weldment that incorporates 0.375-in.-diameter steel rods and a 0.060-in.-thick sheet metal stamping of 1018 CR material. Each weld is the same, 0.75 in. long with a 0.25- in. fillet, perhaps including weaving. The assembly is fixtured and welded robotically using GMAW with CO2 gas and repeated 100 to 300 times. We utilize vertical welding, but which is a better progression, down or up? 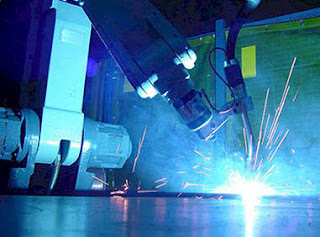 Vertical-up and vertical-down welding are significantly different from one another in the technique used and the resulting finish weld. This is the reason welding codes consider this change in progression an essential variable and require additional testing when changing from one to the other. From your description, I would have to conclude that of all the possible positions (flat, horizontal, vertical, and overhead), this is an ideal candidate for welding vertical-down. Your greatest concern in this application is going to be burn-through on the 0.060-in. sheet metal. Welding vertical-up will be difficult, if not impossible, in this configuration because of the low travel speed and high heat input. Welding vertical-up with GMAW typically requires a weave technique to carry the puddle and give you the proper bead profile. GMAW vertical-up is a deep-penetrating technique, and this characteristic is going to lead to consistent burn-through. GMAW vertical-down, on the other hand, tends to lack penetration and side-wall fusion. These characteristics are undesirable in most applications, but given that you are using a fully automated system, tight control of wire feed speed (WFS), voltage, travel speed, and bead placement should allow you to counteract these characteristics and control your finish weld quality. I’ve had a lot of success setting up similar applications in what I call the 45-degree vertical-down position. The key is using a slight drag angle (10-15 degrees) and keeping the arc on the leading edge of the puddle at all times. This is a little easier to do at a 45-degree incline than at straight 90 degrees. If possible, consider a mix shielding gas (minimum 85 percent argon/maximum15 percent CO2) as opposed to the straight CO2 you are using today. This should reduce chances of burn-through and reduce weld spatter considerably. A 0.035-diameter solid electrode should work well in this application. You stated the weld size was 0.25 in. Talk to the engineering team and your customer about reducing the weld size to 0.19 or even 0.125, which will help increase travel speed, ensure penetration into the root, and reduce cost. Large welds with no root penetration or side-wall fusion are of little benefit to your customers.